Say, isn’t it about time to get that home page posted in cyberspace? If you're one of those people who often thinks about putting one together, but have never gotten a "Round Tuit", then here are some tips which might help. I think many of us tend to procrastinate because of our fear of the unknown, or the mistaken belief that web page design is either too difficult or expensive. I thought about doing mine for well over a year before I finally decided to get off my duff and just do it. I found out that it's really not that painful. And trust me, I'm no expert in this rapidly changing field. But if you get just one good idea from my rather unorthodox approach that helps spur you into action, then perhaps our time together will have been well-spent. Nowadays there are lots of good web design resources available, such as the web authoring tools that are part of the new MS Office 2000, which of course require that you part with a little (euphemism for MUCH!) of your hard-earned cash. But as for me, no thanks. Two and a half years ago when I started my efforts to get into cyberspace, I was low on cash and just had a cheap, used notebook computer without even a CD-ROM drive. I investigated a few software programs like Front Page and Internet Assistant for MS Word, and then discovered quite by accident -- SURPRISE -- that the browser I was using at the time, Netscape Navigator Gold, was not only a browser, but included a web page editor as well. I started using it then, and still am today. I figure if it ain't broken, don't fix it. It is a forerunner to Netscape Composer, which has more bells and whistles and is part of the Netscape Communicator browser http://home.netscape.com/download/index.html, but the original version I am using can still be downloaded FREE from Netscape's software archives page (Incidentally, an older version is also available in Japanese). Actually the program isn’t a lot more complicated than just using a word processing program -- typing, cutting and pasting, changing font size and color, bolding, italicizing, and underlining text, etc. -- it's all pretty much the same. The best thing about all this is you don’t have to learn HTML. YEAH! The Netscape site also includes lots of on-line help on their "Resources for Creating Web Sites" page http://home.netscape.com/browsers/createsites/index.html, including the "Netscape Page Wizard" and the "Netscape Creating Web Sites Tool Chest." The good selection of various web page templates as well as tons of clip art, buttons, animated graphics, textured backgrounds, etc. makes it a snap to get started laying out very nice-looking web pages. And if you're a photo nut like me, you’ll probably want to add some pictures to your site. As for me, I’m too cheap and broke to own a digital camera, so I just scan the snapshots I’ve taken through the years with my various cheap aim-and-shoot and disposable cameras. I recently upgraded from my old cheap Mustek hand-held scanner to a very reliable and inexpensive A-4 size flatbed scanner I ordered from Cyberian Outpost http://outpost.com for only $99 (just a tad cheaper than a digital camera). It’s made by Canon (CanoScan Model FB620P), is tiny, and weighs only 2kg. I ordered it on-line on a Sun. night during one of their free international shipping campaigns and had it in my hands here in Tokyo by Friday afternoon. Cyberian Outpost also has a cool order tracking service (Sorry, this probably sounds like an ad). Regarding page size and layout, when I am surfing the net, I've noticed that the fastest that pages usually load on my machine is about 3-4k/sec., so as a general rule, if possible I think it's best to keep your pages including graphics under, say, 200k so they don't take much longer than a minute or so to load. I have used the thumbnail photo method (where by clicking on a small photo, you can open a much larger photo) on my site and that seems to allow the pages to load fairly quickly. And you'll probably want do all of us old farts with failing eyesight a big favor by opting for larger fonts and bold text where appropriate. I can't believe all the web sites nowadays with illegible strange-colored text on strange-colored backgrounds or with print so small it practically takes a magnifying glass to read. Hey, crank up that font! If you want music on your site, there are a number of options. I have used the free Crescendo player http://www.liveupdate.com on mine, but I guess nowadays it makes more sense to use Windows Media Player or Real Audio if you can swing it. Recently there was some kind of copyright problem with a number of the larger MIDI music archive web sites, who were threatened with lawsuits, and some of whom had to, at least temporarily, cease and desist. But I know there are still thousands of sites still available where you can download to your heart's content. And I've even heard you can use MP3 files for background music, but those files are HUMONGOUS, so I hate to think how long you might have to wait for the music to load and actually start playing. As for uploading your files to your internet service provider, I have had good luck with WS_FTP32, an easy-to-use file transfer protocol program which came with the original floppy disk furnished by my former internet service provider. Most providers allow you between 10-20MB for your home page, which is probably OK for a non-business site. Also, there are a lot of places out there that offer free web space (although personally, I think the pop-up ads do get to be VERY annoying). Last but not least, don’t hesitate to lean on those who have "been there, done that" for help. I would have never gotten into cyberspace myself without a lot of hand-holding from a number of very gracious folks, including some of whom do this sort of thing for a living. It might even be a good idea if we set up a special newsgroup on our TPC web site to tap into the vast body of knowledge on this subject that I'm sure exists among members in our own club. So, best wishes in finally getting it done. You have my moral support. Look me up if you have any questions or if I can be of any assistance. 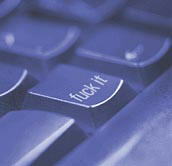 And if all else fails, you can always use the new key (shown to the right) on the latest computer keyboard which resolves all problems.